Mesa County News: Let Solid Waste Management get you summer ready! Let Solid Waste Management get you summer ready! With warming temperatures, you might be thinking about clearing out the garage or getting your yard ready for summer. Did you know that Mesa County Solid Waste Management Campus offers many services to help you tackle that to-do list? The Hazardous Waste Collection Facility, located at the Mesa County Solid Waste Management Campus, offers free disposal of all household chemicals to Mesa County residents. Items accepted include old fertilizers, herbicides, pesticides, paint, motor oil, batteries, light bulbs, and more. The Organic Materials Compost Facility, located on the Mesa County Solid Waste Management Campus, offers free disposal of leaves, lawn clippings, and tree trimmings to Mesa County residents. While you are there be sure to pick up some Mesa Magic Compost or Dark Wood Mulch for your garden and lawn; fees apply. Did you know each household in Mesa County receives one free disposal at the Mesa County Landfill each year? Bring your ID and a piece of mail showing your physical address to the Landfill Monday through Friday, 8 a.m. to 4 p.m., to pick up your Landfill Pass. The Landfill Pass grants you one free visit to the Mesa County Landfill. The Landfill Pass does not apply to tires or electronics and must be used within two weeks of issue. All loads coming into the Landfill must be tarped. Let the folks at Mesa County’s Solid Waste Management Campus help you get your summer off to a great start! 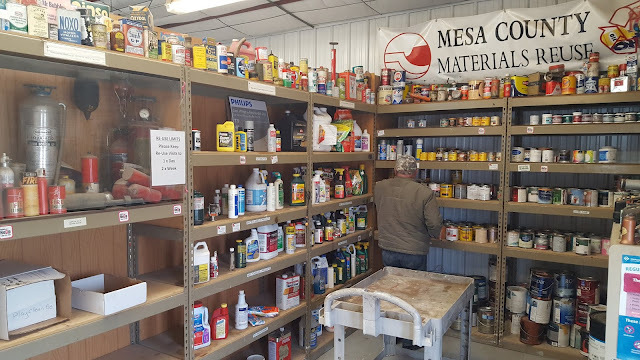 Visit the website for a complete list of materials accepted at each facility and the hours of operation at https://www.mesacounty.us/swm/ or call 970-241-6846 for more information.